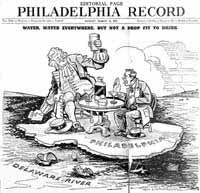 A discussion (under the heading "Purity") of the need to relieve the Schuylkill River--the source of much of Philadelphia's drinking water--from sewage pollution. Construction of an interceptor sewer within the City limits began in the early 1880s, but pollution from upstream sources continued to be a problem. Thousands of people died during annual typhoid fever epidemics in the City during the second half of the 19th century and the first decade of the 20th century (more than a thousand died in 1906 alone), and many thousands more were sickened by typhoid and other water-borne diseases. The Fairmount Water Works were abandoned by the City in 1909, after filtration plants were constructed at the newer Belmont, Queen Lane and Roxborough pumping stations along the Schuylkill. Sewage pollution of the supply continued, but filtration, combined with chlorination of the water supply beginning in 1912, rendered the water safe to drink, if somewhat harsh to the palate. Philadelphia water became known by many pejoratives, including the "Schuylkill Cocktail." A 1936 cartoon shows an old Quaker personage (perhaps William Penn himself?) creating this beverage: dipping water out of the murky river with a cocktail shaker, with chlorine on the table ready to be mixed in. His companion seems less than willing to partake. The daily average consumption of water at present is about fifty million gallons, at a cost of $180,000 per year. The ratio of increase for the past twenty-five years will not double the demand until 1910, a period of thirty-four years. This would not justify an expensive system, either by gravity or water-power, with its impounding reservoirs, in the present financial condition of the city; therefore, we are compelled to look to steam as our motive-power, and to perfect our present system, which would otherwise be destroyed. Fairmount pool could be kept pure at little more expense, by driving a tunnel diagonally under the city to Broad and Norris Streets, under a district as yet unimproved, thence along Norris Street, emptying the sewage into the Delaware, as shown by plan "B" on the topographic map. This sewer would not interfere with the manufacturing interests on the stream. It would intercept the offensive products of their industries and the sewage, and while preventing the fouling of Fairmount dam, it would, by means of the shafts necessary in its construction, drain nearly three square miles of area unprovided with main sewer, and for which area one is already proposed. The sewer from the Falls to the Delaware River is the basis of a system. This subject belongs to a co-ordinate department, the outlines of which are only presented; the details are of record in this office as incident to the maintenance of the water of the Schuylkill as a course of supply. A study of the topographic map of the city divides it naturally into three great drainage districts. The first is West Philadelphia. The second is east of the Schuylkill and southwest of the Germantown Road, which is the divide between the Schuylkill and Delaware. The third is north and east of this ridge. By means of intercepting sewers, provided with overflows for the escape of storm-water in heavy rainfalls, the sewage of these districts can be kept out of the Schuylkill and the docks along the Delaware front. The first district, provided with one of these sewers, west of, and parallel to the Schuylkill, emptying into the Darby Creek, can be drained into the Delaware at the Lazaretto. The entire Second District can be drained into the Delaware at Greenwich Point. The sewage of the area north of the Falls Village would be carried by the tunnel to Second and Norris Streets, thence down Second Street, intercepting in its course the sewage now emptying into the Delaware along the river front. This sewer to intersect at Second and Packer Streets with an intercepting sewer east of and parallel with the Schuylkill front. The course of this sewer would follow a diagonal, and empty at Greenwich Point. It could be flushed its entire length, either by the Schuylkill River or the Wissahickon Creek. The Third District is divided into sub-districts, which are provided with intercepting sewers in the valleys of the Frankford, Wissinoming, Pennypack, and Poquessing Creeks, which in turn empty into a main intercepting sewer parallel with the Delaware, and emptying into it at the mouth of the Aramingo Canal. This system relieves the City of sewage, without contaminating its water supply. By means of the overflows the heavy rainfalls are delivered directly into the large streams; the sewers are small, saving expense in their construction, requiring but little water to flush them, and preventing deposit by a constant flow of at least one-half their capacity.